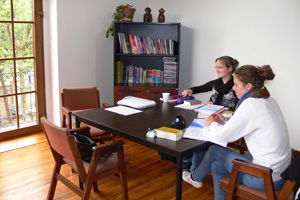 We have Spanish language schools in Quito and Cuenca, Ecuador. Our schools offer Spanish courses at all levels, as well as Volunteer Work. Learning Spanish in Ecuador, you will also have the opportunity to travel to the Galapagos Islands, if you wish. 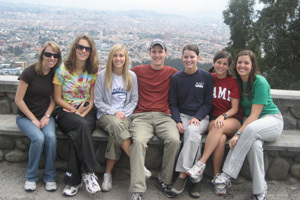 Both Quito and Cuenca are incredible destinations in which to study Spanish in Latin America. Ecuador is a small, stable, democratic country, a beautiful land of colour and contrast, with some of the most varied geography in South America; towering Andes Mountains, coastal tropical plains, Amazonian rain forest and the amazing Galapagos Islands, 600 miles offshore. Cuenca lies in a high Andean valley (6,700 feet), 440 km to the south of Quito. Though a modern city of 250,000 inhabitants, Cuenca is famous for its beautiful colonial architecture, cobbled streets, pre-Hispanic ruins, churches and Indian markets. Our school has 8 well equipped classrooms and is located in the city centre. The school provides an extensive cultural programme, including visits, parties, films, 5 extra culture lessons a week, plus 3 full-day excursions a month. Fly to Quito. Our school can arrange for you to be met at the airport in Quito as well as overnight accommodation in Quito and a connecting flight to Cuenca the next day.